This week, we released an update that optimizes the look of our software interface. The new look, however, did not change the functionality of the software. This means our current users are able to continue to use Orbital Shift just as they had before. Other than the look of our software changing there are four improvements we would like to highlight. 1. Text descriptions for buttons have been removed and replaced by icons. For example, the Daily Notes button no longer says “Daily Notes”, but is now represented by an arrow icon. 2. The user’s name is now a drop down menu located in the top right corner of the Scheduler Page, next to the Location drop down. From this Current User drop down, the current user can Logout or view details about their account. 3. We made the Views drop down menu its own horizontal menu bar located above the Daily Notes/ Publish / Locked/ Conflicts display. Now you can toggle between different Views (Day, Week, Month, Custom, Payroll) even quicker, allowing you to complete your schedule, payroll, and reporting responsibilities even faster than before. 4. Lastly, we optimized the user experience by improving the scalability of the Schedule Page. Our users can now zoom in and out without sacrificing image quality. 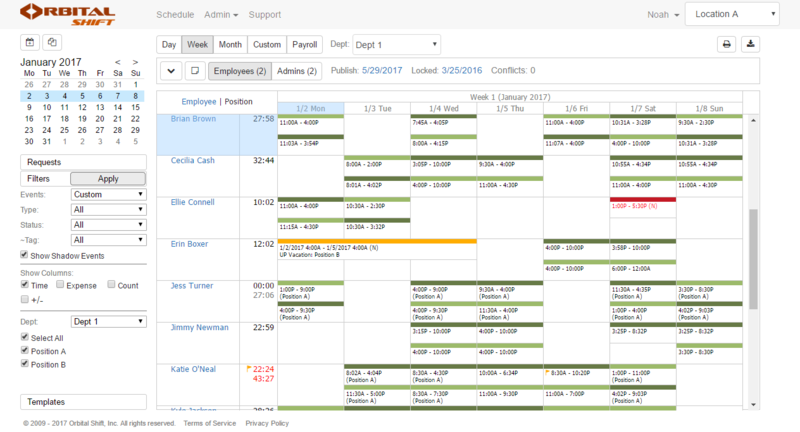 This allows users with less than perfect eyesight to zoom in on the Schedule without it becoming granular. We are excited to announce an update to our software’s visual appearance as we continue to improve the functionality for both current and future users. As an organization, our goal is to make running a business easier and more efficient. We strive to accomplish this by providing managers and employees with software that is engaging and empowers them to work smarter. We believe improving the user experience of Orbital Shift is an important first step in transforming the way managers and employees work together. If you would like to receive updates regarding Orbital Shift’s new features and other relevant workforce management announcements, follow us on social media by clicking the social media icons located at the top of this page and subscribe to our blog by filling out our blog subscription form, which can also be found on the top of this page. Contact us today to get started with your free 30-day trial! !